Recently, over 50 students – most of them graduate students – showed up for the day-long Big Pixel Hackathon to Discover the Planet in Atkinson Hall’s Calit2 Theater. 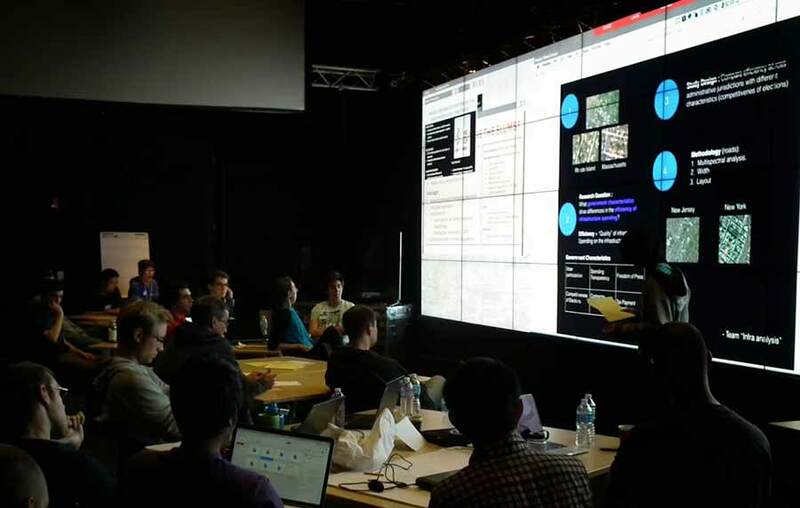 The May 23 hackathon was organized by the Big Pixel Initiative (BPI) to showcase what can happen when you let students loose on the largest private collection of high-resolution satellite imagery on earth. Co-directors Gordon Hanson, a professor in the School of Global Policy and Strategy (GPS), and Qualcomm Institute research scientist Albert Yu-Min Lin oversaw the event, with hands-on management by lead coordinator Jessica Block and postdoctoral researcher (and GIS expert) Ran Goldblatt, both based in the Qualcomm Institute. “Teams tackled how to measure the growth of urban slums in poor countries, how to measure the impact of natural disasters on water quality in cities (such as the typhoon that devastated the Philippines last year), how to identify illegal fishing in the Caribbean and how to find boats engaged in human trafficking in the Mediterranean,” Hanson said. Support for the Big Pixel Initiative derived originally from a Calit2 Strategic Research Opportunities (CSRO) grant from the Qualcomm Institute, and later $200,000 in funding from the Center for Global Transformation in the School of Global Policy and Strategy. BPI also benefited from Frontiers in Innovation scholarships that supported two Ph.D. students from Political Science – Michael Davidson and Sara Kerosky – who work on remote sensing to detect and measure illegal coastal mining in the Philippines with high-resolution satellite imagery. Team took a machine learning approach to determining where slums are globally. That imagery comes from a global repository of satellite images called the DigitalGlobe Basemap, and UC San Diego is one of only two universities offered free access to the entire archive for one year. After that, Digital Globe will decide whether to continue, expand or disband the program. On June 17-18 Block and Goldblatt will visit Digital Globe headquarters in Colorado Springs, CO, to deliver a preliminary report on projects at UCSD that are using Basemap imagery. The day-long hackathon was unlike most hackathons. The teams were not asked to come up with a finished app or clean-cut solution, but rather, to ask big policy questions that might be addressed with satellite imagery that is accurate down to a resolution of half a meter (about 16 inches). Dotted around the room were satellite and aerial images from important areas pre-curated by Block and her team, in broad topic areas such as Water, Land or Transport. Depending on the research question resolved by each team, they were given access to download specific image tiles from the earth database, covering areas including Tijuana and San Diego, French Polynesia, Gujarat and Mumbai in India, oil and gas regions in Texas and Alberta, Canada, Brazil, and so on. Students divided into multidisciplinary teams. “The participants were about evenly divided between those with technical backgrounds and those with social or oceanography backgrounds,” said QI’s Goldblatt. CSE’s 17 students accounted for the largest number in the hackathon. The next largest contingent came from Economics, with eight students, followed by the Scripps Institution of Oceanography with six. Three other departments had four students each: Electrical and Computer Engineering, Mathematics, and Political Science, while students from Literature and Music were also there. The hackathon distributed $1,500 in cash prizes to the 13 members of three winning teams in what are unusual categories for a hackathon. In the first category, teams competed to come up with the Best Research Question. The diverse group included students from Math (Joanne Yeh), Scripps Institution of Oceanography (Lynn Waterhouse and Brian Stock), as well as Computer Science and Engineering (sophomore Liz Izhikevich). The team looked at whether satellite images can help predict the impact of small-scale fisheries on the environment. The team came up with a neat computer vision-based solution for detecting hotspots of activity by small fishing boats, often in places where fishing is supposed to be restricted. Tracking unregistered global sea traffic won for the Most Compelling Visualization/Strategy. Another ocean-related project won for Most Compelling Visualization/Strategy. The team set out to track unregistered (i.e., possibly illegitimate) global sea traffic. In principle, this would include the identification of ships carrying migrants (they showed one example of a ship in the Mediterranean crowded with passengers – visible even from a satellite in space). The five-member team included students from Economics (Kilian Heilmann and Wei You), Math (Bjorn Wehlin), ECE (Yonatan Vaizman) and CSE (MS student Dev Agarwal). The prize for Most Insightful Discovery went to a project that asked why some areas recover from natural disaster more quickly than others? The four-member team looked at before-and-after satellite images for differences in color and shape, particularly focusing on the rate at which vegetation grows back. Winning team members included Li Yu from ECE, Kevin Hung from Economics, Zachary Steinert-Threlkeld from Political Science, and graduating senior Kevin Hung, a double major in CSE and Math (who is also a co-founder of the relatively new Data Science Student Society at UC San Diego). Looking at satellite images of hard-hit Tacloban City before and after Typhoon Haiyan battered the Philippines in November 2013, they came up with a “compute disaster damage” index applied to the before-and-after images. They also looked at other factors that are likely to have an impact on the speed of recovery, ranging from median incomes (which spell faster recovery) to census data. Other teams in the hackathon came up with powerful questions that might be difficult to answer without an archive of data as large as the DigitalGlobe Basemap. For example, one group took a machine-learning approach to deciphering where the slums are globally. This required looking at things like how big the houses are, how many per block, the amount of vegetation, and other factors, all of which were built into a machine-learning algorithm to produce impact maps and survey frames. Team Infra Analysis submits their final report on differences in efficiency of infrastructure spending as visible in comparing different metro regions. A group calling themselves Team Infra Analysis, dominated by members from Economics and Political Science, asked the question: What government characteristics drive differences in the efficiency of infrastructure spending? They began by defining efficiency as the quality of infrastructure divided by how much was spent on it. They also broke down six government characteristics to be measured, including voter participation, freedom of the press, the transparency of government spending, etc. They also looked at efficiency in areas with very different administrative approaches (e.g., in places where tax compliance is high versus areas where most people and businesses routinely fail to pay their taxes). The team used roads as the primary indicator of efficiency, including how wide they are and how straight. 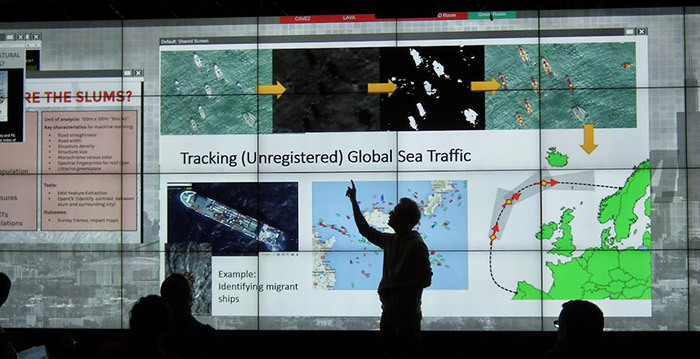 The final project assessed whether satellite imagery could be a reliable way to count marine mammals, using computer vision to detect features of whales, as well as crowdsourcing to tag images in order to improve the accuracy. 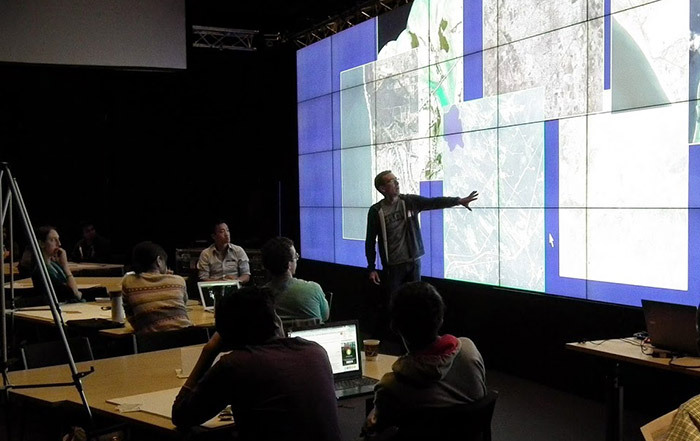 Beyond the hackathon, the primary vehicle for demonstrating how researchers can best use the Digital Globe Basemap has been a grant program to fund specific faculty projects that transcend single disciplines. Faculty were invited to propose and experiment with “at scale” studies made possible by global satellite imagery. So far, nine faculty grants have been approved. Research scientists Lev Manovich and Mehrdad Yazdani from QI’s Software Studies Initiative are merging GIS imagery with data from Instagram to determine if the combined visual data can delineate what various socio-economic areas look like (and to correlate how well it does the job compared to the gold standard, the census). Rex Douglass, a postdoctoral researcher in Mathematics with a Ph.D. in Political Science, is using satellite imagery to detect refugee camps in places such as Burma where there is virtually no access for Western media to existing refugee facilities. Qualcomm Institute researchers Ran Goldblatt and Jessica Block are testing how well they can detect, visualize and quantify oil and gas wells in economically disadvantaged regions, and they are also looking at industrial development in India (as reflected in changes related to land use and land care). Jennifer Burney from the School of Global Policy and Strategy is the PI on three mini-grants to address: scaling in cities at high spatial resolution; remote groundwater mapping using crowdsourcing and machine learning, and measuring land degradation in the semi-arid tropics. Other UC San Diego recipients of grants from the Big Pixel Initiative included Stuart Sandin and Jennifer Smith of the Scripps Institution of Oceanography, a team from Mathematics led by professor David A. Meyer with postdoc Orest Bucicovschi and Ph.D. student Dongjin Song, Mathematics’ Asif Shakeel (satellite data for humanitarian assistance), and a team from SDSC and the Qualcomm Institute (Ilkay Altintas and Mehrdad Yazdani) developing a workflow toolbox for dynamic and scalable integration and analysis of Digital Globe datasets and other big-data sources. In addition, Qualcomm Institute researchers Ran Goldblatt and Jessica Block are testing how well they can detect, visualize and quantify oil and gas wells in economically disadvantaged regions, and they are also looking at industrial development in India (as reflected in changes related to land use and land care). This week Block and Goldblatt will brief Digital Globe on results barely three months after the Foundation announced that UC San Diego would be the primary research home for the one-year pilot study. 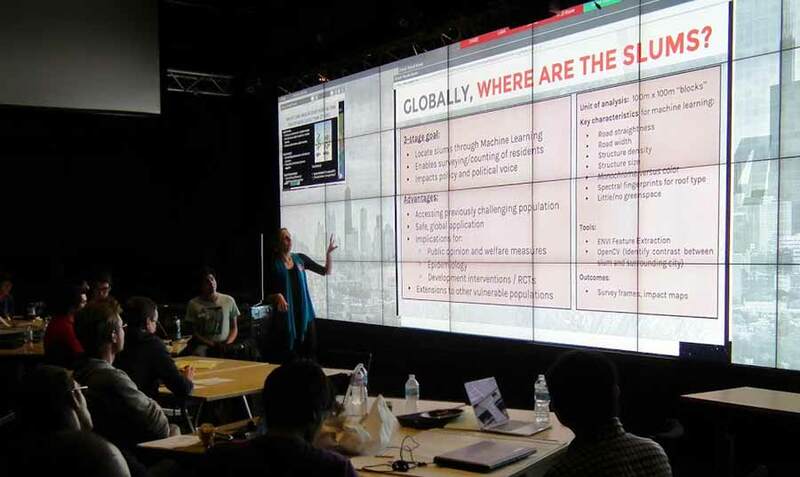 Having nine faculty projects and a student hackathon under their belt, organizers of the Big Pixel Initiative think the university is making a strong case for continued access to the satellite imagery on a longer-term basis.